Friday was the final day of the climate change negotiations at the Conference of Parties (COP 21) in Paris, which has now been extended till Saturday. The updated versions of the draft agreement text were uploaded on the United Nations Framework Convention on Climate Change website. These two texts gave us an idea about the progress of the negotiations taking place in the French capital. Till now, two draft texts on the COP 21 agenda have been released. Version 1 was released on December 9, 2015 and after that an updated version 2 was released on the very next day. 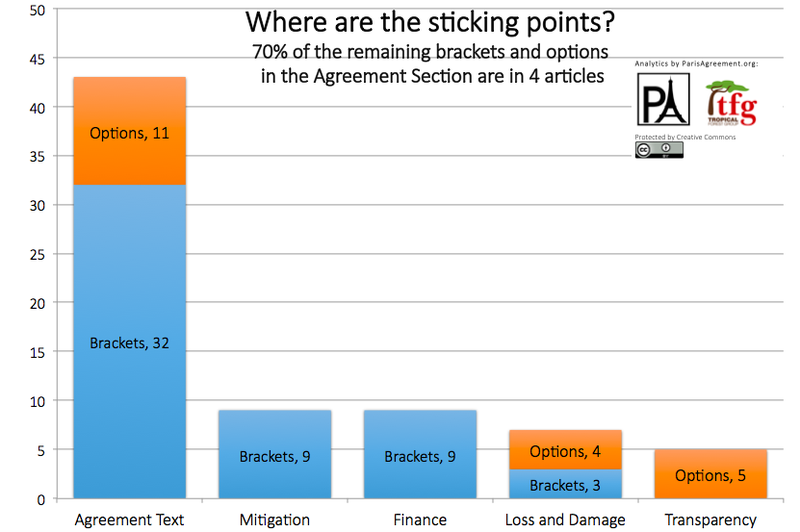 It looks like a lot of progress has been made in these two updated versions of the draft agreement text, at least in terms of the number of brackets and options. 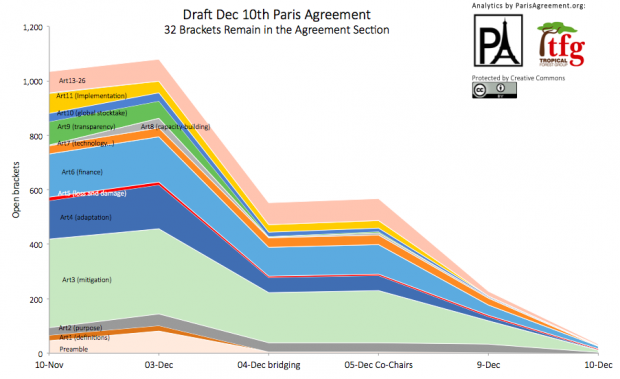 Further, it is clear from the graph uploaded below that a number of brackets, which were put forth by different Parties negotiating in Paris, have been significantly reduced in the latest version of the draft text. The reduced number of brackets and options in the latest version of the draft text indicates that the Parties have resolved a lot of issues in the language of the agreement and moved towards a consensus on most of the issues. Despite the impression that the countries are moving towards a consensus (as it looks like from graph 1), core problematic issues still remain unresolved. These issues are mitigation, finance, loss and damage, adaptation and transparency. These issues have the maximum number of brackets and options, as is evident clearly in the chart given below. This indicates that for the above-mentioned issues, different countries have different positions and a lot of issues on these themes remain unresolved. Countries are experiencing conflict on core issues such as equity and common but differentiated responsibilities. It is surprising that an important term, “Global carbon budget”, has been completely removed from the latest draft text version. This is a huge setback for the developing nations, which are not historically responsible in creating the problem of climate change in the first place. “Global carbon budget” was very much part of version 1. Delhi-based non-profit Centre for Science and Environment has been consistently fighting for the carbon space issue. It also reelased a book, Capitan America, on the US climate goals. Indian Prime Minister Narendra Modi, in his opening remarks in Paris, had spoken about the need of prioritising carbon space for development, thus treating it as an important intervention on behalf of developing countries. Two other issues, which are crucial for poor and developing countries, are adaptation and loss and damage. But as of now there is no commitment on the adaptation front. In the draft text released on December 9, the Parties talked about “reviewing the overall progress in achieving the global goal on adaptation referred to in paragraph 1 of this Article”, which talked about global adaptation goals. However, now in the current text, there is no specific mention of any global adaptation goal, as it has been removed from the latest version 2. However, “global adaptation goals” was very much part of version 1. No satisfactory consensus has been reached on loss and damage as well, which is a major concern for vulnerable countries such as least developed countries and small island developing states. The progress made so far in Paris does not lead to an effective and satisfactory deal. Developed countries led by the USA are trying their best to dilute the principle of Common But Differentiated Responsibility as well as equity. The irony is that on the one hand, USA is leading a group of countries under the name “High Ambition” Coalition, but on the other hand US Secretary of State John Kerry is saying that he cannot do more than this, referring to the current American position. The US and European countries do not want to commit to any “number” on the issue of finance. Poor and developing countries are demanding climate finance based on the historical responsibility of rich countries and not in form of any aid. With just a day remaining for the final negotiations, it is hoped that the countries gathered in Paris will show some real leadership in leading our planet towards a greener future. We all should take care of our planet for our own good. One can only hope that good sense prevails so that vulnerable communities across the world, including farmers affected by climate change, can heave a sigh of relief.